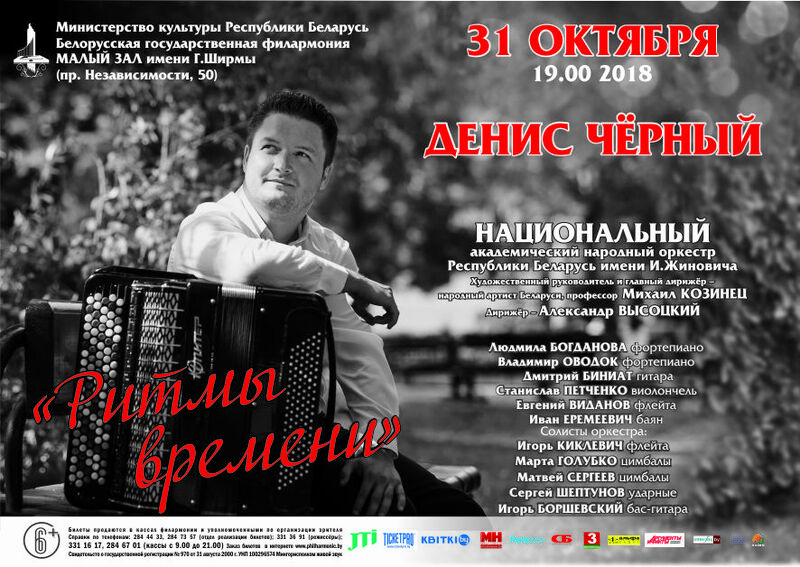 Home / Bill / "Time rhythms"
On 31 October, 2018 will hold a solo recital of the famous bayan-player Denis Cherny in the Small Hall named after G.Shirma. Denis Cherny is a laureate of the internationals competitions and for nigh on ten years he is a principal soloist of the National Academic Folk Orchestra of the Republic of Belarus named after I. Zhinovich conducted by People’s Artist of the Republic of Belarus, Professor Mikhail Kozinets. With the advent of a young talented musician the repertoire of the Orchestra became rich of the new authentic compositions. The choice of these compositions is determined by the irreproachable taste of bayan-player virtuoso Denis Cherny, who can make not only sophisticated technical difficulties, but also who has the desire to convey artistic images in music. The choice of these compositions is determined by the irreproachable taste of bayan-player virtuoso Denis Cherny, who can make not only sophisticated technical difficulties, but also who has the desire to convey artistic images in music. Denis Cherny excellently performs on the button accordion the passionate tango of A.Piazzolla and the graceful waltzes on the french way by R.Galliano, sultry Latin American bossa nova and spectacular plays in folk style. Each of these works reflects the rhythms of our time, its contrasting patterns which were modified by the skills of bayan-player virtuoso. The laureates of internationals competitions, such artists of the orchestra as: Martha Golubko (cymbals), Igor Kiklevich (flute), Sergey Sheptunov (xylophone), as well as musician's friends – Evgeny Vidanov (flute), Lyudmila Bogdanova and Vladimir Ovodok (piano), Dmitry Biniat (guitar), Stanislav Petchenko (cello) will appear on the stage together with Denis Cherny. All musicians will play accompanied by the National Academic Folk Orchestra of the Republic of Belarus named after I. Zhinovich.